There are few issues more important to EU governments than energy security. Promises of EU solidarity may mean less than they seem, explains Tomas Maltby. The crisis in Ukraine has caused the European Union to urgently revise its policy on energy and energy security. In February the European Council agreed that existing efforts to reduce dependency on gas imports “should be intensified”. As a result, in May the European Commission launched a proposal for a ‘European Energy Security Strategy’. The following month, member states issued an agreement via the European Council to move “towards an Energy Union”. These initiatives are part of what the EU calls its “hard-headed strategy for energy security”, which seeks to accelerate the development of infrastructure, use EU energy law as the basis for an international agreement through a strengthened Energy Community, find ways to “increase the Union’s bargaining power” and enforce internal market and competition rules with respect to energy infrastructure investments. This latter measure has affected the South Stream gas pipeline, which is intended to carry gas from Russia to Southern and Central Europe. Reluctantly, and under pressure from the EU, Bulgaria agreed in June to suspend construction on the South Stream project – an action soon replicated by Serbia. The case illustrates divergent member state energy policy preferences, despite EU policy statements. It also reflects the broader tension between the EU’s growing interventionist role in strategic national energy policy and the limitations of the attempt to increase energy policy integration. 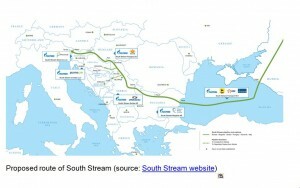 The EU is concerned about South Stream for several reasons. Firstly, the agreements signed between Russia and the member states must accord with the new Third Energy Package rules, including making the pipeline available to third party access, which Bulgaria seemed to be trying to avoid. Secondly, Gazprom is under investigation for abusing its monopoly power in Central and Eastern European gas markets. Thirdly, diversifying supplies of gas has been a priority since the 2006 and 2009 supply disruptions and the ongoing Ukraine-Russia crisis has pushed security of supply back to the top of the agenda, with a European Parliament vote “tak[ing] the view that the South Stream pipeline should not be built”. In addition, the EU is concerned about a possible breach of internal market legislation regarding public contracts for the project. To complicate matters further, the construction contract in Bulgaria was awarded to Stroytransgaz, which is on the list of US sanctions against Russia. The South Stream pipeline demonstrates how the priorities of the EU, particularly the Commission, are not entirely synchronised with those of member states. South Stream has never been an EU priority, since it only reroutes imports of Russian gas rather than linking Europe with new supplies. Yet Austria, Bulgaria, Hungary, Italy and Serbia have, since early June, illustrated how energy security is defined by national interest, with the governments of all five countries reiterating their support for the project. For these countries, a pipeline from Russia, excluding Ukraine, represents a guaranteed security of supply. As such, South Stream exemplifies the lack of member state consensus regarding a common EU energy policy and the divergent understandings of energy security. Not all member states consider dependence on Russia to be a risk. While all member states have thrown their weight behind the common principle of“increased efforts to reduce Europe’s high energy dependency”, this often comes secondary to national energy, economic and foreign policy priorities. To understand why these tensions exist, we need to consider the 2007 Lisbon Treaty. The Lisbon Treaty enshrined the right of a member state to “determine the conditions for exploiting its energy resources, its choice between different energy sources and the general structure of its energy supply”. These specified rights contribute to the current stand-off regarding South Stream – as well as member state resistance, led by Poland and the UK, to further regulation of shale gas. Yet it is important to note that there has been an important shift in the governance of EU energy policy. Member states have delegated sovereignty to the EU on a number of essential energy security issues since the 2006 and 2009 gas supply disruptions. Obliging member states to inform the Commission and then each other of new and existing bilateral energy agreements with third countries (the 2012information exchange mechanism). Despite the creeping integration which has characterised energy policy – and has increased significantly since 2009 – national interest remains likely to trump any true EU energy policy or union which seeks “to speak… with one voice in external energy policy”. South Stream is still likely to proceed, with delays, but the EU is asserting itself in a previously national domain. Energy Commissioner Oettinger argued in July that “We can’t just give in to the Russians every time”; adding that “In order to start operating, it [South Stream] has to be subjected to our rules”. These rules were set by the member states and their enforcement has been delegated to the EU. As crises continue, the pressure to delegate to member states a little more power to achieve a little more security will also continue. Tomas Maltby is a researcher in the Politics department at the University of Manchester. He recently submitted his PhD on the impact of newer member states on EU energy policy and is currently researching agenda-setting within the EU, EU-Russia energy relations and renewable energy policy.